Bundle Monster 4pc Jacquard Weave Design X-Back Adjustable Clip Unisex Suspender by Bundle Monster at Sherlock Coat. MPN: app-066-5_h15. Hurry! Limited time offer. Offer valid only while supplies last. Suspenders are back in style and you, or someone you know, can rock this truly unique fashion by making your own statement with one of our designs! Suspenders are back in style and you, or someone you know, can rock this truly unique fashion by making your own statement with one of our designs! Pick from 5 different sets. Either use it to hold up your bottoms or use it as an added accessory to your look! You'll receive a unisex mixed 4 sets of X-back strapped in Jacquard weave design pattern with adjustable, clip-on suspenders. All straps are made of stretch polyester and are 1.25" wide. Pair it with your favorite trousers or even with your skinny jeans - each design will add a fresh, classy look. *SIZE OF SUSPENDERS*: Adjustable strap measures 24.5" to 38" long, end to end, un-stretched. Clips measure 0.9 in. wide by 1.25 in. tall. *NOTE*: Due to differences between monitor displays, actual color may vary slightly from image. Bundle Monster is a registered trademark of Remi Collections LLC and is exclusively distributed by Bundle Monster. Bundle Monster trademark is protected by Trademark Law. HELPS KEEP YOUR PANTS UP - Sometimes belts just won't do the job, but with this set you don't need to tug your pants all the time. WIVES & DAUGHTERS LOVE THEM - Many women shared that men's wearing suspenders do look sleek and classy. CLASPS ARE STRONG - Enjoy a good fit with our high quality clasps that grip on securely without unintentional unbuckling. MATCHES ALL OUTFITS - With our classy solids or simple patterns, any one of these sets will make you look awesome and super charge your confidence. 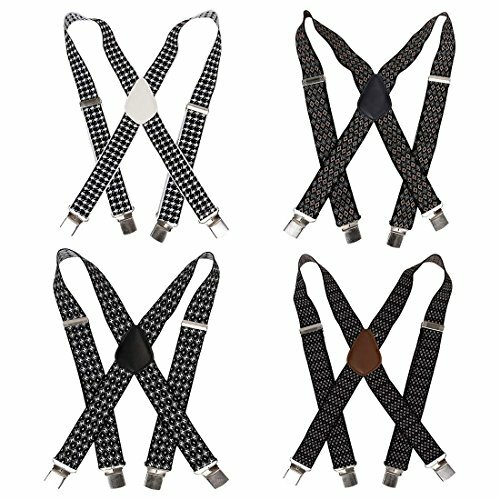 AMAZING BUNDLE DEALS - Rock these suspenders with styles without breaking your wallet. If you have any questions about this product by Bundle Monster, contact us by completing and submitting the form below. If you are looking for a specif part number, please include it with your message.